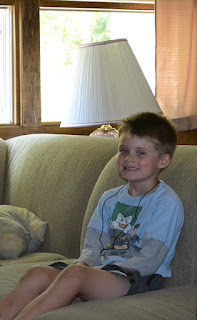 Zeke is seven! He actually turned seven on August 20th but things were a bit chaotic then - and your response is aren't they always? Which is mostly true. But in my defense, they were a bit more chaotic than normal. But I digress. He had a good party - Lego themed - with lots of his family & close friends and has been busily making Lego creations since then. I did a birthday interview with Ellie earlier this year and I thought I would try it out with him as well. He didn't hesitate at all - he just fired off answers one right after the other! After the interview, I included a few shots from his party that my Dad took. Zeke was so busy running around that day I'm surprised he was able to get any! How old are you today? Six. Wait! I mean, seven! I'm seven! Seven years old. What's your favorite song? Journey. Which Journey song? "Any Way You Want It." What's your favorite food? Beans. If you could eat anything you wanted to eat - ANYTHING - what would you choose? Pizza Rolls. But beans are my favorite. Put beans! What's your favorite drink? Coke. What's your favorite toy? (no hesitation whatsoever) Legos! What's your favorite color? Blue. (pause) And green too. What's your favorite TV show? Flintstones. What's your favorite movie? Star Wars. All of them? Or one in particular? What's par-tick-u-lar? I mean, do you like them all or is one of them more your favorite than the others? I just like them all. What kind of birthday party did you have this year? 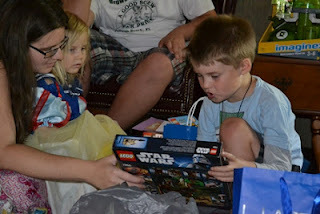 I had a Lego Birthday. Did you have fun? Yes, very much. What do you want to be when you grow up? A firefighter. What is your favorite place to go? Like to a friend's house? No wait, a hotel. Yes, a hotel! Is there anything you're scared of? Hmm....monsters. Is there anything else you'd like to say? Nah. I'm done. i love this post! freaking adorable. That is so cute. What a great idea to record his opinions every year. That will be fun to look back on. :) Stopping by from SITS. Cute post! Your son is adorable! My kids LOVE Legos, too! We talk about Legos every day, and once they get a new set, they seem to be looking forward to the next. Thanks! :) Yes, the Legos are never ending it seems like, haha. Oh, what a sweet idea - I love that you interviewed your son! Something fun to look back on as well as his tastes change as he grows. Star Wars and Legos, I have to say he's a pretty cool kid :) Hope he had a great b-day! So sweet! 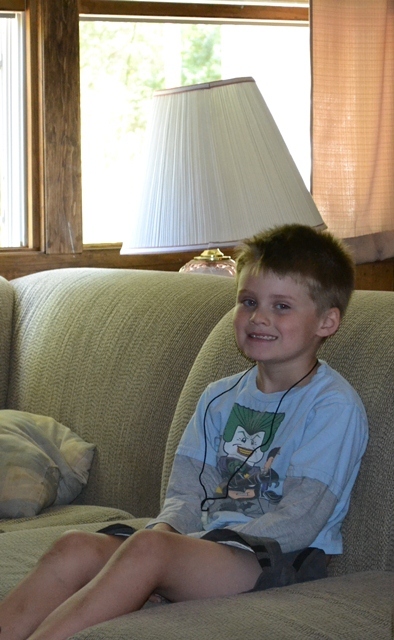 I interviewed my son on his third birthday, and plan to use the same questions each year. 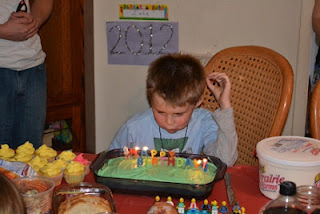 I can't wait to see what he comes up with in January for his 4th birthday!